Part of the Bushcamp Company camps, Kapamba is a luxurious bush camp on the banks of the Kapamba River, a tributary of the Luangwa. This is in the far south of the park in an area used almost exclusively by the Bushcamp Company so very few tourists and other vehicles are encountered here. The wildlife in the area is prolific and includes a frequently seen group of wild dogs, the 'Kapamba pack'. Walking safaris are the main activity here and sundowner drinks are often taken sitting in the river cooling off as the day comes to an end. The camp has four permanent thatch-covered stone chalets, each with a private veranda, so you can enjoy views of the Kapamba River from the privacy of your own room. All have en-suite bathrooms with large sunken bath and twin showers, toilet and double vanities. There are two doubles and two twins and all are open to the widest side, giving private views to the water and having a trellis of metal doors which can close at night to make you feel more secure from the wildlife! There is a central deck with the lounge, bar and dining area overlooking the river, which flows year round. "LOVED this camp. The rooms are really funky, with bright â€˜Africanâ€™ colours and decor and the bath is pretty spectacular too! I could have easily spent 5 days here to really experience the bush in all its glory. " "Relaxed and friendly, lovely location, great food. Loved it despite the rain and I think we may have brought some frogs home with us - they get everywhere!" 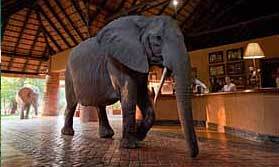 "Kampamba Camp has a 'rustic wow factor'! It's style of huge stone rooms open on the wide side are something very different to other camps. Sitting in the huge plunge pool (sorry - bath tub they call them!) watching out over the river is a great experience and the game viewing in this remote corner of the park is fantastic."